This fine old whiskey should be enjoyed neat or over ice. "Pappy" used to say, "why ship water all over the country." In keeping with his theory and practice, Julian Van Winkle has chosen to offer this whiskey at a higher than usual 95.6 proof. This higher proof allows all the incredible flavors to come out with each tasting. This truly is an older and wiser "Pappy."" I recommend drinking this Pappy before the 23 year so you will be able to enjoy this one for all it has to offer. 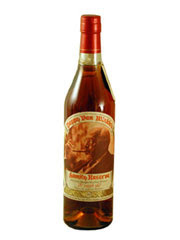 This Pappy although sophisticated is very light on the palate and rich with the Carmel goodness of any great bourbon. There is an earthy corn character to this one that can catch one off guard. A pleasure to drink and not completely overshadowed by his big brother the 23 year old. Cognac not needed for an enjoyable cigar after a great meal, Pappy is all you will need!